Get twice the combination of LED effects with the dual lens feature of the Dual Gem Pulse from ADJ. Offering an array of effects including Moonflower, the built in programs, low weight, and low power draw make the Dual Gem Pulse easy to use, easy to transport and great choice for any light entertainment system. Bring your DJ entertainment setup and party to the next level with the Dual Gem Pulse from ADJ. 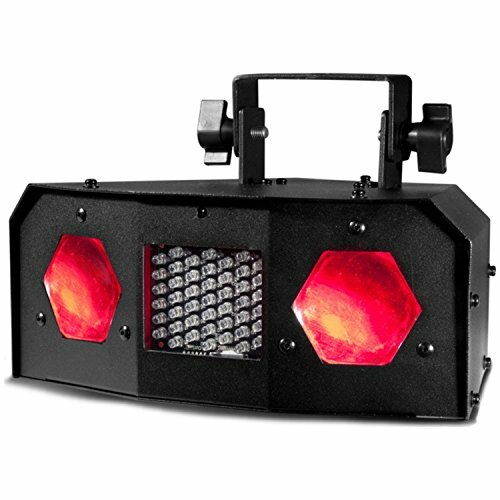 Utilizing two lenses the Dual Gem Pulse offers you the ability to project strobe effects and a Moonflower effect on the wall or dance floor. With a wide beam spread and angle you can cover a large area with this compact device. With Sound Active mode and built-in programs, set-up and synchronization is easy. Set yourself apart with this LED light entertainment unit as you get people grooving to your music. With its low weight, very low power consumption and long life LEDs you'll save money on the road, at home, or at your bar or club. It's time to amp up your entertainment system with theADJ Dual Gem Pulse, liven up your nights with LED lights.